The Fall that my daughter was five, after recovering from the flu, she lost her lovey. It was horrible. As the Fall wore on and got worse and worse in so many ways, the loss of her beloved Cow became more and more important and more and more a symbol for my struggles as a parent and her struggles to grow up. Now ten years old, she has had her replacement Cow for about as long, if not longer, as original Cow. Sometimes though, she and I still think about Cow. This weekend my girl and I had some unexpected mother/daughter time, and even better, some unexpected mother/daughter time where she wanted to go do something. Lately my tween is more likely to want to listen to music or watch TV. Last weekend, when faced with a whole night to ourselves she wanted to invite over friends. Suddenly, movie night is better with friends than with Mommy. But, on this beautiful Sunday, she really wanted to go to the bookstore. So we set off to walk to the bookstore, lunch, ice cream, and possible mani/pedis. In between the bookstore and the ice cream store across the street we saw the guy above resting on a concrete planter. Clearly some child had dropped him out of a stroller and a thoughtful passerby had placed him where he could be found. But it seemed as though perhaps he had been there for a while. “Maybe we should take him home and see if we can find his owner?” I suggested. She agreed, and we decided that if he was still waiting when we were done with our ice cream, we’d take him home. After ice cream we decided to cross the street for nails, but the wait was too long. It was my daughter who reminded me to cross back over and see if the bunny was still there. He was and we scooped him in to our bag, setting off for home holding hands. On the way home my daughter wondered what we would do if no one claimed him and came up with the idea of taking him to the library, since they have a display case of lost and found items. “Yes,” she answered quietly. “Me, too” I said. When we got home, she turned on “Austin and Ally” and I went upstairs to start finding the rightful owner of Bunny. I posted the bunny on Facebook and Twitter and within minutes discovered that in fact, someone had put a missing notice on MomMail for him. 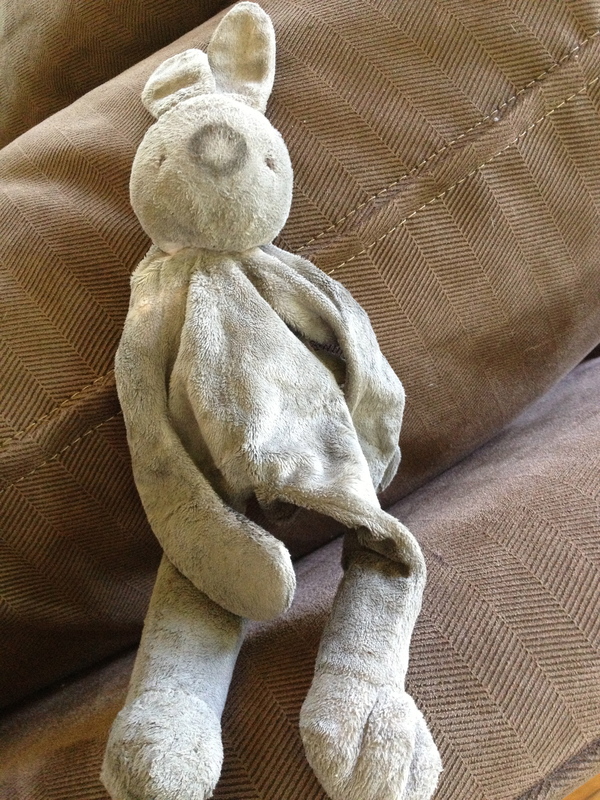 In her message she said that this bunny, lost in the exact location where we found him, had been with them “since birth.” I eagerly replied and sent a photo, my mind filled with images of my daughter returning this beloved stuffie to a five year old girl. The cycle becoming complete, her hard-learned lessons about love and loss tempered after all these years with lessons about love and return and the generosity of strangers. My first inkling that the story did not quite have the happy ending I was anticipating was when the mother wrote me back an hour later saying she wasn’t sure if this was hers, because hers was pink and had a pacifier attached. It is irrational, but her potential denial of this bunny made me angry. Did she not know what a stroke of luck she had been given? I have no doubt that if Cow turned up now, five years later, ripped to shreds and stained a different color from dirt, I would still recognize him and instantly claim him. I assured her that on close inspection you could see the bunny had once been pink. I asked if she could pick him up today, before five so that my daughter could have a chance to return the bunny to its owner before leaving for a sleepover. It took several hours for her to write me back. In the meantime, my daughter lovingly washed the bunny so that its owner would not be shocked by the filth. When the reply came the woman explained that Bunny belonged to her six-month-old baby who was happily cuddling the backup Bunny, that mainly, she was the one who wanted it for sentimental reasons, and could she come some time this week. It is Tuesday, and Bunny is still keeping me company at my desk. In her emails this woman was sweet and kind and full of gratitude, but still part of me, the part of me that was angered by her initial doubt about Bunny, is disappointed with this loving mother. I know that some of my disappointment is my own ridiculousness. My own bizarre and unhealthy desire to still, five years later, find a way of fixing my daughter’s loss. Although in some ways small, my daughter’s loss of Cow was real and like all true loss, is is unfixable. But part of it is me wanting to reach out to this mother, to warn her that five or ten years from now, when she has had a chance to see how quickly daughters change, how quickly we lose their childhood, she will be angry at herself for waiting even two hours to reclaim even a tiny, stained piece of it. UPDATE: The mother and her perfect, pink bundle of a baby girl came by tonight (Wednesday) to claim the bunny. My daughter was excited and happy to be able to give the bunny back. The mother was genuinely grateful, she brought my daughter a box of pink Peeps (pink bunnies for a pink bunny) and wrote us a lovely thank-you note. So, we did get our happy ending after all. This entry was posted in Advice I'd Like to Give, Family Life and tagged children, Loss. Bookmark the permalink.